Consider a donation toward the care of waterfowl! Every spring and summer, Wild Care receives dozens of orphaned waterfowl – these are baby ducks, swans and geese that have been separated from their families. Common forms of separation include ducklings falling into storm drains and window wells, fishing debris injuries, hit by car injuries, and abandonment due to interaction and harassment by people and pets. Sadly, it doesn’t stop there. We receive injured adult waterfowl too. One of the most common reasons that adult waterfowl are brought to our door is because they have become sickened by lead poisoning. The long necks of geese and ducks, allow them to ingest lead shot, lead sinkers and jigs, and other foreign objects at the bottom of our waterways. Left untreated, lead poisoning causes neurological symptoms, starvation and ultimately death. We also see many adult waterfowl with injuries related to gunshot, fishing debris and vehicle strikes. Please make a donation today to help us to get waterfowl lead free, back on their feet, and into the water where they belong. Quackers’s story began in 2008 when he came to Wild Care near death after being discovered in a rescuer’s driveway. Quackers was a domestic Indian Runner Duck, and since he was not a wild animal, Wild Care took him in as a foster duck after fully treating him. He soon became the mascot of Wild Care. He was inquisitive, friendly, funny, quirky – all in all, a very memorable duck. He was the “foster dad” to many orphaned ducklings, cygnets and goslings. No matter what creature you were, Quackers put a smile on your face! 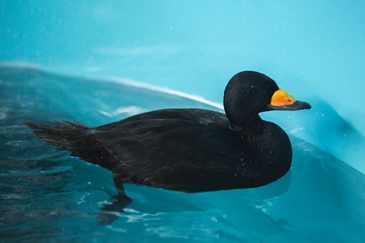 In great sadness, our beloved Quackers passed away peacefully at Wild Care on November 4, 2015. Quackers was approximately 8 years old, which is an average life expectancy for his breed. In Quacker’s memory, Wild Care has set up a memorial fund. Donations will go towards the thousands of animals Wild Care treats every year. To donate to Quacker’s Memorial Fund, please click here or the button below. Thank you to the entire Wild Care family, friends and supporters for loving our adored Quackers!